After my last glossary post on LoRa, I thought I'd write another one of C&sharp; and .NET, as (in typical Microsoft fashion it would seem), they're seems to be a lot of jargon floating around whose meaning is not always obvious. If you're new to C&sharp; and the .NET ecosystems, I wouldn't recommend tackling all of this at once - especially the bottom ~3 definitions - with those in particular there's a lot to get your head around. C&sharp; is an object-oriented programming language that was invented by Microsoft. It's cross-platform, and is usually written in an IDE (Integrated Development Environment), which has a deeper understanding of the code you write than a regular text editor. IDEs include Visual Studio (for Windows) and MonoDevelop (for everyone else). A Solution (sometimes referred to as a Visual Studio Solution) is the top-level definition of a project, contained in a file ending in .sln. Each solution may contain one or more Project Files (not to be confused with the project you're working on itself), each of which gets compiled into a single binary. Each project may have its own dependencies too: whether they be a core standard library, another project, or a NuGet package. A project contains your code, and sits 1 level down from a solution file. Normally, a solution file will sit in the root directory of your repository, and the projects will each have their own sub-folders. While each project has a single output file (be that a .dll class library or a standalone .exe executable), a project may have multiple dependencies - leading to many files in the build output folder. The build process and dependency definitions for a project are defined in the .csproj file. This file is written in XML, and can be edited to perform advanced build steps, should you need to do something that the GUI of your IDE doesn't support. I've blogged about the structuring of this file before (see here, and also a bit more here), should you find yourself curious. Known as Common Intermediate Language, CIL is the binary format that C&sharp; (also Visual Basic and F&sharp; code) code gets compiled into. From here, the .NET runtime (on Windows) or Mono (on macOS, Linux, etc.) can execute it to run the compiled project. The build system for Solutions and Projects. It reads a .sln or .csproj (there are others for different languages, but I won't list them here) file and executes the defined build instructions. The .NET Framework is the standard library of C&sharp; it provides practically everything you'll need to perform most common tasks. It does not provide a framework for constructing GUIs and Graphical Interfaces. You can browse the API reference over at the official .NET API Browser. The Windows Presentation Foundation is a Windows-only GUI framework. Powered by XAML (eXtensible Application Markup Language) definitions of what the GUI should look like, it provides everything you need to create a native-looking GUI on Windows. It does not work on macOS and Linux. To create a cross-platform program that works on all 3 operating systems, you'll need to use an alternative GUI framework, such as XWT or Gtk# (also: Glade). A more complete list of cross-platform frameworks can be found here. It's worth noting that Windows Forms, although a tempting option, aren't as flexible as the other options listed here. The 7th version of the C&sharp; language specification. This includes the syntax of the language, but not the .NET Framework itself. A specification of the .NET Framework, but not the C&sharp; Language. As of the time of typing, the latest version is 2.0, although version 1.6 is commonly used too. The intention here is the improve cross-platform portability of .NET programs by defining a specification for a subset of the full .NET Framework standard library that all platforms will always be able to use. This includes Android and iOS through the use of Xamarin. Note that all .NET Standard projects are class libraries. In order to create an executable, you'll have to add an additional Project to your Solution that references your .NET Standard class library. A web framework for .NET-based programming languages (in our case C&sharp;). Allows you to write C&sharp; code to handle HTTP (and now WebSockets) requests in a similar manner to PHP, but different in that your code still needs compiling. Compiled code is then managed by a web server IIS web server (on Windows). With the release of .NET Core, ASP.NET is now obsolete. Coming in 2 versions so far (1.0 and 2.0), .NET Core is the replacement for ASP.NET (though this is not its exclusive purpose). As far as I understand it, .NET Core is a modular runtime that allows programs targeting it to run multiple platforms. Such programs can either be ASP.NET Core, or a Universal Windows Platform application for the Windows Store. ....along with the pair of official "Introducing" blog posts that I've included in the Sources and Further Reading section below. 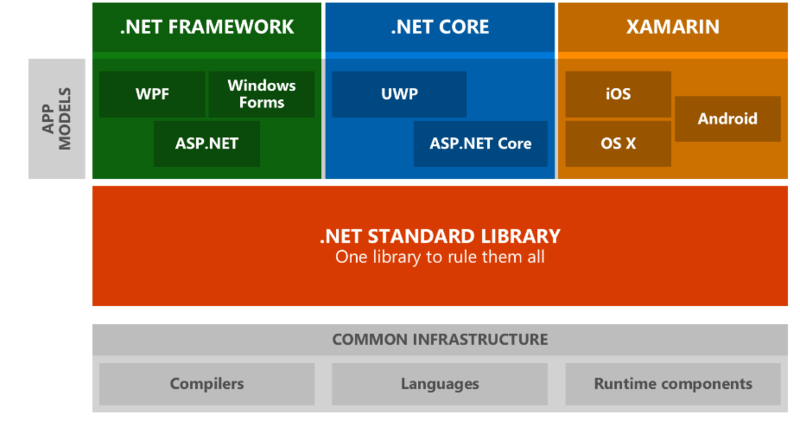 We've looked at some of the confusing terminology in the .NET ecosystems, and examined each of them in turn. We started by defining and untangling the process by which your C&sharp; code is compiled and run, and then moved on to the different variants and specifications related to the .NET Framework and C&sharp;. As always, this is a starting point - not an ending point! I'd recommend doing some additional reading and experimentation to figure out all the details. Found this helpful? Still confused? Spotted a mistake? Comment below! Hello! I hope everyone had a nice restful Easter. Cloudflare made an exciting announcement recently (more on that later), which inspired me to sit down and write about a vital, but invisible, part of the internet we know today. It's called DNS (Domain Name System), and I'd like to take you on a journey - showing you what DNS is, how it works, how it can be exploited, and what we can do about it. After all, privacy is important! How does relate to DNS you ask? Well, I'll show you - but we're getting a little ahead of ourselves. Let's introduce DNS first. I'll explain what it is, how it works, and why we need it. DNS is, in many ways, the backbone of the modern internet. While it isn't directly responsible for delivering billions of packets across the internet every day like the Internet Protocol is, its role is still vitally important. DNS is responsible for translating domain names, such as starbeamrainbowlabs.com, bobsrockets.com, or billsboosters.net into an IP address that your device can connect to in order to do whatever else it needs to do. MX - A bit like a CNAME, but returns a prioritised list of domains that handle email for the specified domain. NS - Specifies which DNS servers can be queried about the domain. SOA - Specifies what the primary DNS server is that holds the authoritative copy of the DNS records for the specified domain. With that in mind, lets try some queries. bbc.co.uk. - The domain name the response is for. 300 - The time-to-live. In other words, the number of seconds that the response can be cached for. AAAA - The type of response record. 2a04:4e42:600::81 - The IPv6 address that the domain name corresponds to. DNS works rather well, most of the time. The problems start to occur when you start thinking about privacy. With more websites than ever now serving their websites over https, the data that we transfer between these websites and our devices is now much more secure - and can't be intercepted, analysed, and modified in transit. DNS, however, is not currently encrypted - which poses a rather serious problem. Anyone able to get a hold of your devices network traffic - such as another device of your network in promiscuous mode, your ISP, or literally anyone in between you and your DNS server - can spy on the DNS lookups your device is doing, and even poison your DNS cache - sending you to an attacker's website when you typed in a legitimate domain name! Thankfully, after 35 years of DNS, the internet has some solutions to some of these problems. First up: DNSSEC. Often misunderstood, the protocol tries to prevent man-in-the-middle and timing attacks (such as the one shown in the diagram above) by cryptographically verifying the DNS records returned to the client. Though it's actually 20 years old already, it's still overly-complicated - and subsequently hasn't been rolled out by an awful lot of people. It's also rather weighty - requiring the transfer of crytographical keys and other associated information. DNS-over-HTTPS - Basically a protocol for sending DNS requests via a standard HTTPS web server. As you can imagine, this can be rather weighty. DNS-over-TLS - As the name implies - DNS queries over a raw TLS connection - which is, in short, a HTTPS connection without the HTTP bit. Now supported natively in Android. DNSCurve - An augmentation to the existing DNS protocol that adds encryption by way of elliptical curves. The supposed official website appears to be a bit biased and inaccurate, so I'm linking to the Wikipedia article here. A bit of mess, isn't it? Furthermore, many applications don't yet have support for some (or any) of these protocols. In that regard, it's currently a waiting game. Still, it's interesting to compare the different approaches taken here. Most of these protocols carry significantly more weight that plain-old DNS - with DNS-over-HTTPS being the most weighty, and DNSCurve being the lightest I should imagine. Encrypted and verified responses are all very well, but it's no good of the owner of the DNS server themselves are logging all the queries you send to them! Google's 8.8.8.8 service logs a percentage of queries made permanently to disk, and OpenDNS don't appear to have very many details on their website about what data they collect and what they don't! Furthermore, some DNS servers (especially those controlled by ISPs) tend to have some domain names censored due to agreements with their country's government - preventing you from 'accessing' a website by stopping your device from figuring out where on the internet to talk to. Clearly, these are serious issues - and the solutions boil down to trust. Who do you trust to send your DNS queries to? If you don't trust any of the aforementioned providers (Google Public DNS or OpenDNS), then you could always run a DNS resolver yourself. For each successive part of the domain name, the DNS server asks the next one in the the chain that other DNS servers hold the authoritative records about that domain name (using SOA / NS records), and then repeats the cycle with the servers provided in the response. Quite quickly you can see that there's an issue here - how does it know where to start? That's where root servers come in. They contain the authoritative information on the Internet's top-level domains. These servers can be queried to figure out which servers hold information about the various country codes (or other codes). The servers that these root servers point to can then be queried to ask who holds information about the various domain names you and I are used to typing in our address bars, such as seanssatellites.io, or billsboosters.edu for instance. This brings me to the announcement by Cloudflare I mentioned at the beginning of this post. By now, you can probably guess what it is: they've set up a new public DNS server! Apparently, they did a deal with [APNIC]() to let them study the garbage traffic that ends up at 1.1.1.1 in exchange for running a DNS server on it. That brings us to the end of our journey through DNS. We've seen what DNS is and how it works. We've also seen how it can be attacked, and what is being done about it. Lastly, we've taken a look at how running your own recursive resolver works, and looked at Cloudflare's new service. If you'd like to continue on and explore DNS further, I've left some links below. Found this informative? Still confused about something? Comment below! Why is there a dot at the end of my domain name? What is the IN bit in a DNS record? What is a DNS Cache (and how can it get poisoned)? Tired of battling endless <script> tags in your html files? Fed up with messing with a dozen libraries cluttering up the place? Can't see the wood from the trees? Try browserify (+ rollupify + wzrd)! It's amazing! It's awesome! It tidies up your code for you, so you don't have to (perhaps not :P)! Seriously though, I've just been playing around with browserify, and it's awesome. It's that missing thing I've been trying to find for a long time. But what does it actually do, you ask? Sounds cool yet? Let me give you a quick tutorial on how I set up Browserify, with Rollupify and Wzrd. Since I've been playing around with the Arduino a bit recently (thank you Rob!) I thought I'd write a quick post on how you can get started with the arudino and it's many variants. If you're into creating electronics and creating circuits, then the arduino is for you. The arduino is a small electronic board that you might find some variant thereof in your thermostat at home, or Rob's thing-o-matic for example. You'll probably find something akin to an arduino in most embedded systems. To get started, you'll need to buy an Arduino Uno (you can probably find it cheaper elsewhere). Some LEDs, resistors, and jumper cables wouldn't hurt either. Once you've got all that, you can start to have some fun. To compile and send programs to your new arudino, you'll need to download and install the Arduino IDE from the official arduino website (direct link for debian / ubuntu users). Once installed, connect your arduino to your computer using the supplied cable and open the IDE. Next, we need to set the IDE up to send correctly compiled programs to our new board. Firstly, we need to tell the IDE what kind of board we have. Go to Tools->Board and select Arduino Uno. We also need to tell the IDE which programmer to use. Go to Tools->Programmer and select AVRISP mkII. Finally, we need to tell the IDE which serial port the arduino is connected on. 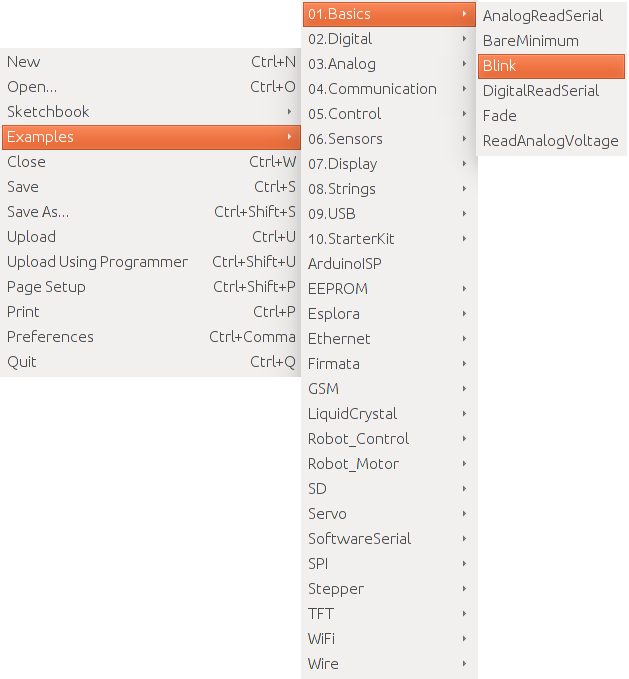 Go to Tools->Serial Port and select the last item in the list. If the next steps don't work, try selecting a different option in this list until it works. With that out of the way, we can start to test out our arduino! Arduinos are programmed using a variant of C, which is similar to GSGL. 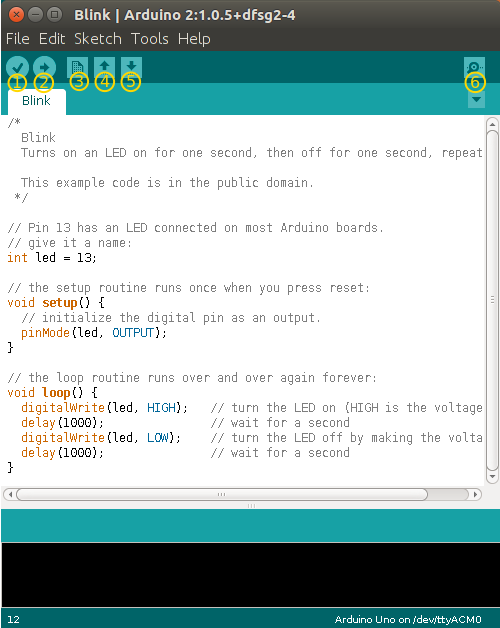 To get started quickly, let's send some example code to our arduino to start with. In the file menu, go to Examples->01. Basics and select Blink. A new window will pop up containing the example code. To compile and send the code to your arduino, click the second button in from the left, with the right facing arrow on it. This will send the code to your arduino. Once it's done, you should see a flashing light on your arduino board! Verify - Compiles and checks your code for syntax errors, but doesn't write it to the arduino. Upload - Compiles your code and sends it to your arduino. New - Creates a new document. This clears your existing tab! Use the down arrow below the 6 in the picture and select New Tab instead. Open - Opens an existing document. Again, this clears your existing tab. Save - This should be obvious. Opens the serial monitor. The serial monitor is like a very basic console which allows you to see what your arduino is saying and lets you send messages to it. That just about covers my very basic getting started tutorial for the arduino. If you've got any questions or comments, please leave them down below. Basic arduino tutorials - Learn more about the arduino board and what everything does. Arduino language reference - Useful when writing code. 08249 Labs - A comprehensive set of tutorials that teach everything that you'll need to get started (Hull University students only). You may have noticed that I've skipped a week in this series. Don't panic - I've done it on purpose. The task for lab 11 felt very close to the assessed coursework (ACW) for the Artificial Intelligence module that I'm learning Prolog in. I've decided to play it safe and hold off on posting about it for now. I might post later - it all depends on what the ACW is. Each letter stands for a digit, and the idea is to write a Prolog program that work out what each of the letters stands for. This problem is actually quite simple, and the particular way that you'd go about solving this has a special name. In the beginning, I only knew one way to writing programs: Functional programming. Next, University introduced me to the wonderful world of Object Oriented Programming. In my second year, my AI module has been bending my mind with Symbolic Programming. Now, I have learnt of a fourth programming paradigm - Constraint based programming. This is then the constraint in raw Prolog. =:= checks for equality in the expression. This code works by creating an array of unknowns, an array of digit values that the array of variables can take, and then assigning each of the variables a value one by one. The expression on lines 10-12 is then tested, and if it doesn't match (which it probably won't), Prolog backtracks and tries to reassign one of the variables it assigned before. It repeats this process until it finds the solution. [9, 5, 6, 7, 1, 0, 8, 2]. [5, 2, 6, 4, 8, 1, 9, 7, 3, 0]. This may well be the last post (Edit:) in this series until the end of the ACW. See you later! The lab numbering has gone a little bit strange this semester it seems (there was a lab 10 last semester), so I've added the semester number to the post title to avoid confusion. This week's lab was all about Eliza. In case you don't know who (or what) an Eliza is, Eliza is an early attempt at building a chatbot. It isn't very clever, and relies on keywords to understand what you are saying. It's still used today though - mainly in NPCs in games, as they only have to deal with a very limited situation. Hello! My name is eliza. In the above I've changed the main loop up a bit to call respond/1 instead of blindly looping back around. This lets me write rules like those starting on lines #8 and #12 that do something depending on the user's input. We can get our eliza to say goodbye and exit by not looping back around if the user mentions the words "quit", "exit", or "leave", or say hello when someone tells us their name and loop back around again. write('You started the input with "my name is".'). write('Detected the word '), write(Term), write(' in the input.'). While detecting the items in a list is fairly straightforward, the double member isn't as obvious. It works by taking advantage of Prolog's backtracking. It provides a choice point for each word in the phrase, and then it loops over each of the keywords that we are searching for. If it finds that the current word isn't equal to any of the keywords that it is searching for, it will fail, backtrack, pick the next word, and try again. Another way of looking at it is that Prolog is trying all possible combinations of the input words and the keywords until it finds a match. If you are following this post as a guide, at this point you can (and should!) add your own custom phrases to practice the techniques described here. Once you have done that, come back here. list_of_excuses(['I see. ', 'Very interesting. ', 'Tell me more. ', 'Fascinating.']). You can use this to tell Prolog that anything in your Prolog program is dynamic. Just change list_of_excuses to the name of the fact or rule, and change the 1 to the arity of the fact or rule that you want to make dynamic. Several things are happening here. firstly, we retract the list of fallback phrases from Prolog's knowledge database and split it up into the first item in the list, and the rest of the items in the list. Next we create a new list that contains the phrase that we at the front at the end, and then we put this new list back into Prolog's knowledge database. Lastly, we output the fallback phrase that was at the beginning of the list (but is now at the end) to the user as our reply, before looping back around again with exliza_loop/1. With that, we our eliza can respond to phrase containing certain keywords, exit when asked, and reply with a fallback phrase if it doesn't understand what was said. Below I have put a small questions and answers type section containing a few of the problems that I had whilst writing this. I've also included the complete Prolog source code that this post is based on. I had several problems whilst writing this program. I've included a few of them below. My eliza fails when it doesn't understand something instead of outputting an error. I found that I didn't get an error message if I included :- after the retract statement. Removing it made it output the error below which I was then able to solve. I'm certain that I put the dynamic name/arity at the top of my prolog source code, but it doesn't work. I got this because I forgot the :- before the word dynamic. If you are getting this error, this isthe reason why. Learning Prolog is back, because apparently I am totally nuts and like to write long blog posts about the hardest programming language to use in existence. To kick off semester 2, we were given an old challenge: Write a cinema program that decides whether somebody can watch a given film or not. I remember this from my very first programming lab with Rob Miles - the first ever task that we were given was to build this exact program in C&sharp;. Because Prolog is such a nasty and difficult language to learn, it has taken until now to learn all the concepts that you would need to write such a program. A Prolog program that will state whether or not a customer can see a movie depending on their age, the movie they want to see, and whether they have an adult with them. film('How to Lose Friends and Alienate People', 15). findall([ Film, Rating ], film(Film, Rating), FilmList). As you should have come to expect with Prolog, the solution here is recursive. Firstly I define a rule to fetch me all the films with a quick findall/3. Then I define list_films/1 which calls all_films/1 to get all the films and passes them over to list_films/2, which actually does the work. I also have a counter here to keep track of the index of each film. This is important because we want to get the user to enter the number of the film that they want to watch. This works by fetching all the films and loading them each into a list that contains their name and rating. These lists are then packaged into one big list, which is then spun through and outputted one by one, whilst incrementing the counter variable. The next part of this problem is asking the user which film they want to see. Surprisingly, this isn't too tough. write('You chose option '), write(FilmNumber), write('.'). Here I define another rule to ask the user which film they want to see, and then define the main cinema loop. The main loop displays a welcome message, lists all the films that we are presently showing using the code we devised above, asks the user which film they want ot watch, and tells them which number they selected. We are getting there, but telling the user which option they selected is a bit pointless, if you ask me. Let's upgrade it to tell us which film we selected and it's rating. write('You want to see '), write(FilmName), write(', which is a '), write(FilmRating), nl. write('Enjoy the film! '), nl, true. My code starts to get a little bit messy here (sorry! ), but I've taken the cinema_loop/1 that we started above and upgraded to call film_rating/2. This new rule actually has a rather misleading name now that I think about it, but it's purpose essentially is to take a given film number and to return it's rating, whilst telling the user which film they selected. film_rating/2 calls another rule that you might find familiar - the nth_element rule that I wrote in semester 1's last lab. GO and take a look at my other post if you are confused. The above simple makes sure that the rating is either 'PG' or '12A', then it make sure that the customer is under 12, then it makes sure that the customer has an adult with them usng the rule below. If all of these comditions are met, then it succeeds. If the user is 12 or over and wants to see a PG or a 12A, then we should let them through without asking them about an adult. That completes the cinema program. Below you can find the source code for the whole thing that I based this post on. There are some unnecessary true.s floating around, but they are just relics from when I was debugging it and couldn't figure out what the problem was. nthelement(0, [ Head | _ ], Head). % Check the user's age against the given film. We are in double figures! Welcome to my solutions for the tenth and final lab session for this semester. This lab lets you in easy, and then hits you with a really nasty problem right at the end. Length is RecursiveLength + 1. ?- listlength([ hurricane, typhoon, cyclone ], Length). I simply recurse over the list in question and add one to a counter variable on the way out. The next one is a bit harder, but still very easy - A rule that returns the nth element in a list. ?- nthelement(2, [sequoia, baobab, redwood], Item). My solution works very similary to my listlength/2 solution, but instead counts down from the number you give it until it reaches zero ,at which point it climbs back out of the recursion again and returns the item that it got up to. Cracking particular problem requires a new brain-breaking type of recursion, called Top-and-Tail recursion. It's specific to Prolog (as far as I know), and means that instead of just recursing over the tail of the list in order to iterate over it, you iterate over the head of the list as well. Since Prolog lets us break arguments down to any depth we like, I break the incoming list down into its head and tail, and then I break the head down into its component head and tail in order to ensure that it is actually a list. I then recurse over the head of the list ad the tail of the list separately, and concatenate the result of the two recursive calls at the end. If the head isn't a list, then I only recurse over the tail, and append the head to the flattened tail on the way out. Result = [a, b, c, d, e] . That concludes all the AI labs for semester 1, although I have another AI lab scheduled for the coming Monday. If it turns out that there's another lab, I'll post about it here. Otherwise, I'll resume this series in sesmeter 2.